This easy to grow heirloom squash has a flavor much like a sweet potato. 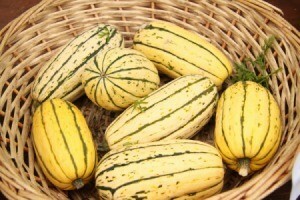 This is a guide about growing sweet potato squash (delicata squash). My Delicata squash blossoms fall off and leave a stem only. No fruit, just a stem. I am in a high wind area. My Butternut squash have lots of growing fruit and they are in the same area. I fertilize organically, only. Do I need to hand pollinate? I grew all my squash from seeds in the same growing medium and they are grown in the same soil mix. What gives? I would try hand pollinating. Wouldn't hurt. I have had to hand pollinate all my squash and cucumbers this year. Thanks Tracey, I have to hand polinate my corn as well. This would be the easiest fix. I have sweet potato squash planted in a large pot. They are making plenty of flowers but no squash. No bees? Since you're getting lots of flowers, a lack of bees could be the problem. If your squash are just starting to flower, it's also not uncommon to see a large number of male flowers with the first flush of flowers. They usually appear first to attract the bees and make sure there will be enough around at the critical time when the female flowers appear. After the first round of flowers, the females flowers will start to appear, too. If you haven't noticed much bee activity, however, you might want to consider hand pollinating your squash. To do this, first you'll need to be able to identify the difference between the male and female flowers. The female buds have a slight bulge at their base (your future squash), while the male flowers are attached to the vine with a long thin stem. Select an equal number of male and female flowers (if available). Pick a male flower and bring it over to the female flower. Peel the petals back from the male flower to expose the stamen and pollen. Gently rub the stamen against the stigma in the center of the female flower to transfer the pollen onto the stigma. Repeat this until you've pollinated all of the available female flowers and in no time you should see those tiny bulbs at the base of the female flowers start to grow into squash. never grew the swt potato squash but a lot of squash are male and female. if you only have one plant that could be the problem.